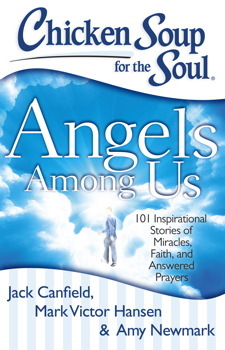 In this book of 101 inspirational stories, contributors share their personal angel experiences of faith, miracles, and answered prayers, which will amaze and inspire you.Celestial, otherworldly, heavenly. Whatever the term, sometimes there is no earthly explanation for what we experience, and a higher power is clearly at work. You will be awed and inspired by these true personal stories from people, religious and non-religious, about hope, healing, and help from angels. I’ve always loved the Chicken Soup for the Soul books. I'm not much of a reader, to be honest. I just don’t have the time, but when these books first started coming out my mom had bought me the Chicken Soup for the Soul: For The Daughter and I loved it. I started reading them and became a huge fan. They are short stories with so much inspiration in them I found myself falling in love with the series. The Angels Among Us has become a favorite of mine. I found myself tearing up a bit while reading each story, as it really hits the heart. I love that these stories not only inspire everyone, but gives hope as well. I also loved that the short stories were short enough that I could read them while my little toddler was down for a nap. The authors truly amaze me with their hard dedicated time and effort to put together such amazing books. I am a true fan and reader of these books and recommend them for all to read. There's something for everyone! Disclosure: All opinions are my own. I received Chicken Soup for the Soul: Angels Among Us at no cost for the purpose of this review. No other compensation was received. Big thanks to the PR company for providing the giveaway prize!